Where does this steam come from? It’s back to Gotham for the latest in our quest to dispel the mysteries of the modern visual landscape. For previous columns, click here; to submit your own suggestions, e-mail us. This series started with a look at mysterious wires that run mostly unnoticed over many city streets, especially in New York. Now it’s time to examine a more visible feature of street life in America’s dirtiest city. No, not the city’s residents—who, though they may be America’s most stylish and diverse, are only the 15th most attractive (or 11th most attractive, when invited to rate themselves). I’m talking instead about the steam that, like Brigitte Bardot clutching a Gauloises, alluringly puffs from the streets of planet Earth’s second-tallest (or sixth-tallest?) metropolis. New York’s photogenic vapors are at once mysterious and commonplace. 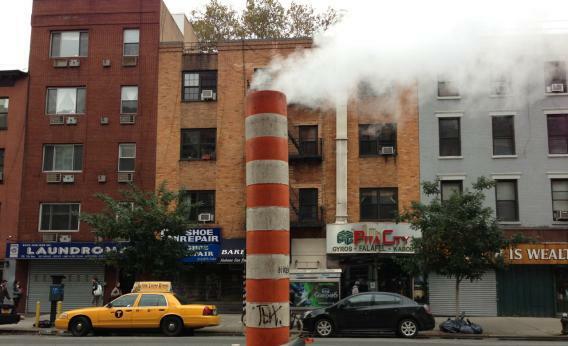 Unless you grew up below 96th Street in Manhattan, you probably first saw this iconic steam on TV or in a movie. (It’s especially prominent in Scorsese’s Taxi Driver.) But whether you’re a visitor, a resident, or a long-distance admirer, this Manhattan spectacle is one of the many small sensory effects that make New York streetscapes so distinctive. The plumes are the perfect visual shorthand for Gotham’s underworld machinations—sandhogs and subways, schist and sewers. a) New York has a network of pipes that move steam around the city, delivering it to buildings just like electricity. This hot steam is used for a variety of purposes, including cooling buildings. b) The network of electrical equipment beneath Manhattan—cables, substations, subway power—is so dense, and so densely covered with concrete, that it requires unique cooling facilities that use water from the Hudson and East Rivers, which then passes as steam into sewer lines, drains, and special vents. d) While nearly every first-world country has converted to electric trains, some American trains—notably Amtrak trains on the Hudson line—are still diesel-powered, which creates problems when the trains go underground as they approach Manhattan. The exhaust is captured by filters in the three specially fitted “diesel tunnels” that lead from 125th Street to Penn Station. Steam is added to the exhaust to ensure it rises out of the system. a). Con Edison, New York City’s venerable power company, pipes steam to customers in Manhattan just like any other utility product (such as gas, water, or electricity). The steam—some purposely created, some a ‘waste’ byproduct of electricity generation—comes from power plants. Commercial, urban steam systems of this size are rare, and New York’s is the world’s largest. (Lockport, N.Y., had the world’s first urban steam system, in 1877, and Denver’s is the world’s oldest in continuous operation.) NYC’s system has 105 miles of main pipes, 3,000 manholes, and reaches around 1,800 buildings—everything from the Empire State Building to United Nations Headquarters. Steam connections run from the southern tip of Manhattan to 96th Street on the West Side and 89th Street on the East Side. What’s the steam used for? A little bit of it is used as, well, steam—to operate laundries and even to sterilize hospital equipment. But a lot of it is used to heat buildings and their water supplies. Surprisingly, given that the steam’s temperature is around 350 degrees Fahrenheit, it’s also used to cool buildings, via the dark magic of absorption refrigerators. According to Michael Clendenin, director of media relations for Con Edison, the use of steam to cool buildings results in a big reduction in summer demand on the electricity grid. Urban steam systems offer significant advantages, because a large power plant is generally much more efficient than individual boilers in buildings. Measures to reduce air pollution can be centralized, too. But given the significant cost in infrastructure—a whole set of pipes under a city doesn’t come cheap—urban steam makes most sense in densely populated areas. Manhattan, say. If the steam is so useful, why is so much of it wafting up into New York’s streets? Much of the steam drifting atmospherically toward the stars isn’t steam from the steam system—rather, it’s produced when water (at least, let’s hope it’s water) from other sources comes into contact with the steam system and is heated into steam itself. Safety valves may also release steam, as do leaks. When ongoing repairs are required, it’s time to put in one of the striped “steam stacks” that are commonly seen in New York. Why? To protect people from burns, and to ensure that the steam doesn’t disrupt traffic. Occasionally the steam system causes more serious mayhem. Three people were killed in a steam system explosion near Gramercy Park in 1989. In 2007, a spectacular explosion killed one person and “propelled a giant scalding jet of brownish steam” 40 stories above East 41st Street and Lexington Avenue. (You can see dramatic pictures of this second event online.) Asbestos, used to insulate old pipes, is an additional concern when such explosions occur. Here’s a simple diagram of the steam system. And for those who really © NY, check out National Geographic’s excellently curated look at how “power pulses, information flies, and steam flows” entirely unseen—except for the occasional puff of steam—beneath the city streets. Wondering what something is—or just looking to blow off some, you know? Take a pic and send it along to whatisthat@markvr.com. Previous editions of What’s That Thing?